Nicklas Backstrom and his fiance, Liza Berg, each had similar gift ideas this holiday season. 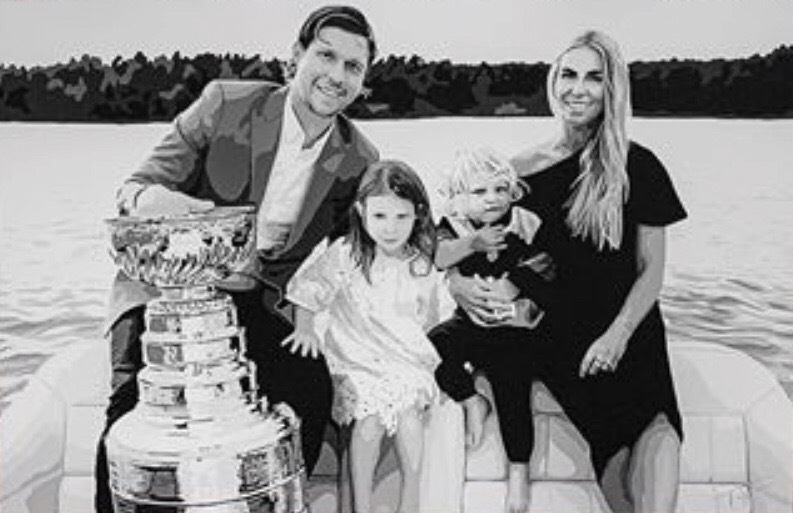 Nick and Liza each contacted artist Taylor Kampa Olson on their own about painting a family portrait with the Stanley Cup. They had each wanted the painting to be a surprise for the other. Liza wanted the painting to be a late birthday gift for Nicklas, while Nicklas wanted it to be a Christmas gift for Liza. But given the timing, Kampa Olson decided that Liza would be the one who would be the “giver”. When Kampa Olson delivered the gift to the Backstrom residence, Nicklas answered the door. He was incredibly nice, even though he probably assumed the delivery was ruining his intended surprise to Liza, given that the artist had arrived relatively early. When Liza came to the door, Nicklas learned the gift was being given to him, as opposed to “from” him. Kampa Olson shared the story on her instagram page on Wednesday. Kampa Olson is based in Virginia and DC. Her website is taylorkampa.com. She can be followed on Instagram at tkopaintings. This entry was posted in News, Players, Washington Capitals and tagged Liza Berg, Nicklas Backstrom, Taylor Kampa Olson. Bookmark the permalink.